One click gift giving! These gift boxes are a Geri Mateus Studios exclusive. Each box is wrapped with a bow and beautifully packed with handcrafted ceramic products from Geri Mateus Studios. Mother's Day - includes a 12 oz. mug, rounded square dish and 3 single serve bags of Schuil coffee. The handmade ceramic rounded square dish, perfect for a morning muffin, is decorated with a hand painted flower and the wording "family is a good thing." 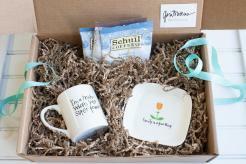 The 12oz mug is decorated with hand painted polka dot handle and wording "I'm a mom, what's your super power?" Sorry, no substitutions or customization. Please note that all of our products are handmade and may vary slightly from their stated size or the picture on this site.